Whether you're a beginner in the world or prepping or a seasoned pro, I think it's important to share with you the four items that you'll never catch me without when it comes to my independent kitchen. Beginning preppers may be a bit overwhelmed with a lot of items on their lists, but rest assured, these 4 will make an invaluable foundation of independence for you. Certainly there are some things that no tool cabinet should be without, no surgeon should be without and that no wedding planner should be without. I can guarantee you that there are also certain kitchen gadgets that NO self-respecting prepper should be without either. I’m going bare bones here…I’m talking about what you just GOT to have if you’re going to be a self-reliant meal provider in your home. First is a Pressure Canner. (I prefer the All American Pressure Canner) Go to garage sales, look on E-bay, go to thrift stores—whatever you’ve got to do, but get yourself at least ONE good quality pressure canner. There’s too much money left on the table if you don’t have one of these. And regardless of all of the myth-information, yes, you can use a pressure canner on a flat top stove so long as your flat top stove is from that past 3 decades. With a pressure canner you can take all kinds of stuff for free and cheap, can them and then put them in a cool, dry, dark storage environment and know that you will always have that to help you out and it will be DEE-LUSH-ous! My favorite thing to can is meat…any kind of meat, fish, venison, lamb, turkey—you name it. If it’s a protein, I’m going to can it. I’ve NEVER tasted anything better, more tender and more meat-y tasting that my own canned meat. You know how you have those Texan cowboys always bragging about how long they marinated their brisket? Well, you’ll always have the upper hand in that conversation because they may be all puffy-chested about marinating their meat for a week and you can tell them you marinated your meat for three years! If I could sprinkle you with fairy dust and convince you of just one thing it would be to NOT be afraid of canning. Technology has come SO far since those horror stories of Great grandma killing Uncle Stan by the exploding pressure canner full of tomatoes. The only sound I love more than the little “plink” of my lids after I’ve canned them is the sound of my slide racking on my Glock. Seriously, canning the life around you is so beautiful to look at, healthy, and cheap. Your investment into a canner is well worth it. And until you can invest, then borrow one from someone until then. It’s a MUST. Canning Granny is a great online resource for canning help and I’ve got LOTS of articles on canning meat, and even bacon on this site. You’ll love the difference! Next, you need a FoodSaver machine that has the air port attachment along with the Mason Jar lid attachments. I use this machine at least once a day and more like a half a dozen times a day. It has a permanent place on my counter. Believe it or not it’s not getting used much for the FoodSaver bags. It’s getting used so much because I store all kinds of dried ingredients in the Mason Jars by using the Mason Jar attachments. The best place I’ve found to get the attachments are online at Amazon.com. However, I’ve also been able to find them at local kitchen stores too. I use the wide mouth attachment the most because I use ½ gallon jars. If you can’t readily find the ½ gallon jar at your local grocery store, try the hardware store. Worst case scenario, have the store order them in for you. They’ll be happy to accommodate you, I’m sure. I preserve all kinds of dry goods well beyond their traditional shelf-life because of the FoodSaver with the Jar Method. (fancy name, eh? *grin*) Cake mixes, oats, brown rice, nuts, candy bars, granola bars, tapioca, pasta, cereal etc. etc. Anything that is dry and is temperamental when it comes to a long shelf-life gets put into the jar and the FoodSaver cranks away making the items very UNtemperamental, lasting 8 to 10 years. I also use the bags when I put the entire box of Rice-A-Roni and other like items in small boxes in a FoodSaver bag and then I put those sealed bags in my 4 gallon square buckets. This trick also extends the shelf-life much longer than normal. Whenever I mention FoodSaver canning, inevitably someone will suggest using a technique called "oven canning" however I'm definitely NOT a fan. Heat, light, oxygen, and humidity are enemies of shelf-life, so it seems completely counter-intuitive to me to seal items in a jar using the oven even if it's at such a low temperature. If I'm going to pay the price so that I can preserve my foods at 68 degrees or lower, then I'm sure as heck not going to degrade them that much more by oven canning them. The great thing about having dry foods preserved with a FoodSaver is that I can use old canning rings/lids so those don’t go to waste, and as long as I open the jar carefully when I want some of the ingredients, then I just take out what I want and then seal it back up again in less than 30 seconds. It’s easy peezy and I can’t imagine my kitchen without it. Again, look on E-bay, Amazon, thrift stores or get a new version at Costco or Sam’s Club. You’ll love it once you incorporate it into your kitchen. Next “must have” is a pressure cooker—not the same as a canner. I only recommend the BRK or the Kuhn Rikon brand. You’ll want a 5 quart or a 7 quart. I like the bigger ones because I can cook a pot roast and still have plenty of room for potatoes in with all of that yummy gravy it naturally makes. Why is a pressure cooker a MUST HAVE? Because, it will save you significant money on fuel and it cooks so much faster and it will even save you money because you can reconstitute freezer-burned foods. These are not cheap, I know. And if you find one that’s cheap please do NOT get it. I loathe the Presto brand when it comes to pressure cookers. You want something that is made of tough enough and thick enough metal that it’s not going to be compromised after a lot of use. Europe and India know how to make their pressure cookers. They wouldn’t be caught dead without one of them in their kitchen and neither should you. If I had to choose between my pressure cooker and my microwave, it would be the pressure cooker hands down. Don’t waste your money on a rice cooker, a crock pot, a skillet, and a Dutch oven. The pressure cooker can handle all of those responsibilities in a fraction of the time, with better taste, and less fuel. I also use my pressure cooker pans as my regular cooking pans too because it heats up faster, higher, and more evenly. The same goes for when I need a pan to deep fry something in. A quality pressure cooker will always beat the other ones hands down. Again, don’t be afraid of it. The brands I suggest to you have several safety features on them and they are quiet! You won’t believe how quiet they are. You can cook frozen meats, hard beans without soaking over night, and brown rice without breaking a sweat. Oh yeah, and speaking of breaking a sweat, you won’t have to heat up your whole house at mealtime with the pressure cooker. Sa-weet! I’ve got a couple of YouTube videos on our channel that you can check out. here and here. That brings me to the next “must have”—a butane cook stove, otherwise known as a Korean cookstove. These are just little single-burner stoves that run on a can of butane. You can cook with butane indoors without worrying about ventilation—unless you’re trying to cook in a 2 foot by 2 foot box. When you combine the power of a pressure cooker with a butane stove, it’s actually fathomable that you could actually store an entire year’s worth of cooking fuel because with a pressure cooker, once you bring it up to full pressure, you can remove it from the heat, wrap it up in a towel, and it will continue cooking for up to an hour. Imagine how much LESS fuel you would need if you cooked this way. You can easily find these at camping supply stores, preparedness oriented stores, and even hardware stores. They shouldn’t run you any more than $20. If they do, don’t buy them there. Last, but definitely not least is a grain grinder. This is something that you don’t want to skimp on either. It’s a vital piece of equipment and if you choose unwisely, you will end up regretting it if you ever find yourself having to rely on it. You’ll need an electric one for now, and a hand-crank for later. You’ll use this for all kinds of needs, not the least of which is making flour out of grain. I can’t stress to you enough that before you purchase a hand-cranked grain mill that you test it out FIRST or at least make sure it has a good return policy. You want to exert as little physical energy as possible to get one cup of flour. For an electric mill I use my Nutrimill and I love it. For my handcrank mill I have both the Family Grain Mill and the Wondermill Junior Deluxe. You want to be able to adjust the coarseness of your flour and if you can get something that has a flaker feature on it as well, then that would be great because you could then flake your beans into flour and you can also then purchase oat groats which store much longer than regular oats, but require a flaker. These items will be invaluable to you in providing safe, quality food for your family, stabilize your food budget, and ensure that you can cook them properly regardless of 99% of the curveballs that could be thrown at you. So please make them a priority in your pursuit of a self-reliant lifestyle. I have a couple of other honorable mentions such as my SoyaJoy Soy Milk Maker which I use to make my almond milk lickety split and of course my Global Sun Oven and my Yogotherm non-electric yogurt maker. But since you can make your own solar oven with a few inexpensive items and not everyone needs to use almond milk and there are plenty of other ways to make yogurt, I’m not going to put them as a “must have.” But in spite of the costs involved, these 4 pieces of equipment I’ve listed are VITAL to you thriving in an independent kitchen even amidst a crisis. they're fine too...but a bit more bulky. I was going with minimalistic. I think they are too thin for my tastes, but they certainly could supply another layer of protection. Yes it is safe to use indoors, and it can save you a lot on your electric bill as well, happy prepping. Thanks for all the good stuff!...I also had this same question, and I tried to search for foodsaver in your sites search box...came up with several articles, none of which seem to relate to foodsavers. I've noticed that before with the search option...hard to tell which article to go to. Can you tell me the name of the specific article you were referring to? For vacuum sealing of jars without using electricity, one might consider using a hand held vacuum pump used in the automotive repair field for testing brake systems and vacuum operated devices. these can be found at places like Harbor Freight for about $20. When in doubt I always call the manufacturers. I'd call Seal-A-Meal if it were me. I have the Seal-a-meal and it didn't come with the jar attachment and I have not been able to find one on their website but I did read today on a blog that the FoodSaver attachment will work with the Seal-a-meal too. Do you know if this is the case before I order one online.? what brand of food saver would be a good one to buy which has an attachment for mason jars. If you live near a Restaurant Depot, they sell them for $24. Usually the fuel canisters are sold in a 4-pack for 6 dollars. Good God lady you are on fire. Thanks for all great info. I will pass this on to family and friends. I have 3 of these "must haves," thanks to your instructions. We don't have the single burner butane stove, but we do have a little butane double burner. It probably isn't as durable as the one you describe, but it serves our purposes, for now, that is. I love my Global Sun Oven and I've been canning meat ever since I stumbled upon your site over 3 years ago. The results I've had have all been excellent and I've learned more about preparedness than I ever thought possible. The word "can't" has no place in life anymore. I credit you, and you alone, for giving me the knowledge and tools to be at peace and confident when those around me are in a state of panic. One thing I was surprised that you didn't mention was a water purifier of some sort, but I know you'll cover that again, as you have many times in the past. You've been such a blessing to me with your tips and techniques and I wish I lived closer to you so I could give you a big bear hug of thanks! You've been an inspiration and a constant source of information and all your efforts to help the rest of us will not be forgotten...EVER! Thank you again, Kellene, for your valuable advice and instruction. You ROCK, girlfriend! I would humbly add a food dehydrator to that list. I have an Excalibur 9 tray that I love. It helps for making healthy snacks, drying herbs. making yogurt, when I have fruits & veggies from my garden (but not enough to can) or when I want to dry the abundance of fruits & veggies my garden produces. The dehydrator coupled with mason jars & the mason jar attachment on the foodsaver is a match made in heaven. I agree. I got a dehydrator last year and use it all the time. My grandson loves jerky. It's a great way to save food. Is butane safe to store in the house? I live in an appartment so I don't have a shed or garage. If not, do you have another suggestion? Thanks! Yes, as long as it's kept cool. You are very right about canning on a flat top stove. I have been running a 22 quart canner on my flat top stove for about 10 years without a single problem. I actually have 2 of the 22 quart canners. 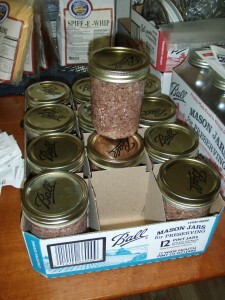 I do an assembly line when I can so that I have a second canner ready to go on when the first comes off (I can ALOT). This has been a common question with canning articles I have written for MSB and on my own blog. Every single canner will tell you in the documentation that it is not appropriate to use it on a smooth top stove, but tell me something can not be done and I will figure out a way to do it. What great info. And what a change - for once I have darn near everything on one of your lists. Only difference is that so far I'm getting by with a camping stove using a different fuel, and don't yet have a great solar oven. When you have a chance, can you blog on how long a canister of butane lasts when cooking with the butane stove, what price the butane is at this time, and how to store that? I wouldn't possibly be able to discuss how long a can of butane lasts. There are far too many variables. I do know though that I can cook 2 meals a day for 3 weeks with a pressure cooker and towel method on 1 can of butane. The best suggestions for storage are directly on the butane cans. "cool environment." I watch for butane cans to hit $1.50 a can and once they hit that price point I buy up all I can afford. Thanks for all the great info :) However, I'd put a dehydrator over a pressure cooker any day. The more I read & study, the more I'm finding that pressure cookers are not a good choice for cooking food. The high pressure, high heat, & fast cooking is super detrimental to the food. 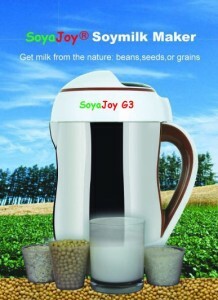 Everyone says it keeps the nutrients inside & makes the food tender. But that type of cooking kills the nutrients & pressure cooked food of any kind is basically dead. This is addressed on a few websites I've found as well as John Widtsoe's Word of Wisdom book, The Weston A. Price Foundation, & Sally Fallon's book "Nourishing Traditions." So what I'm realizing is that slower, lower heat traditional cooking is the way to go. It may take a little longer, but it's so much more worth it. My pressure cooker has been sitting on the shelf by its little lonesome for over a year now. And though I'm tempted to pull it out & use it once in a while, I leave it there until I have a chance to either sell it (which I don't want to do) - or throw it away (which I'm trying to get up the nerve to do). I REALLY think this subject needs more looking into by many more people. It just makes sense. I've gone over a decade without the need of a dehydrator, why? Because a solar oven does the job and a little bit better as well AND because I can bottle almost anything. The title of the article indicates that we're talking MUST HAVE items. Your automobile in the sun will work for dehydrating foods. I find it ironic that you're concerned with the quality of food and nutrients when you're such an advocate of dehydrating. You retain no more than 70% of your nutrients in dehydrated food. Secondly, low and slow is the absolute best way to eat just about anything (which a solar oven does accomplish) however this site IS a preparedness one, which means that I'm trying to give suggestions that will benefit a person in a crisis scenario. Low and slow is a luxury many will not have in such circumstances. Furthermore, I love, love, love Weston and Fallon, but I'm afraid they are incorrect in any assertions made about pressure cooking be an inferior form of nutrition than traditional methods. The nutrients have no way of escaping while cooking. Enzymes are what makes food tender. Regardless of the heat and pressure, if they nutritional enzymes were to dissipate then no matter what you did the food would still not be tender and yet it always is with a pressure cooker. Haven't you ever cooked something all day in a crock pot only to still have it turn out tough? That's because so much of it escapes through the not-so-snug lids on the crock pots. Bottom line, the information you're relying on to come to this conclusion is simply not accurate as indicated by mounds and mounds of information and research done by the nations who HAVE to rely on a pressure cooker in their home as a result of sporadic electricity and high costs of fuel. Cooking low and slow simply is not a luxury they can afford and neither will a lot of others in a serious crisis scenario. To be clear though, there's nothing better nutrient wise than practicing the art of zymurgy. Increasing the enzyme action in your food by fermenting it or even just sprouting is ideal for all of us. I'd be happy to purchase your pressure cooker from you--so long as it's not a Presto. Years ago I took Wendy DeWitt's advice for prepping and bought all these wonderful products, one by one. Since she was in AZ and I was in AZ, I decided that she knew what she was talking about and she did. We then moved to WA and I discovered that my solar oven was not so great up here. So I would suggest to readers to take into consideration where you live. I would add a Volcano oven and a clothes washing device. I bought my All-American Canner last and wish I had bought it first. Great article. A solar oven wasn't one of the 4 "must have" items a person must have. I stand by my 4 items for the kitchen with plenty of other items that I just love, love, love. But the 4 items are indeed musts. I agree with Holly about the Excaliber dehydrator. I also use mine on the lowest heat setting for bread raising. Kellene, Why don't you use your All merican pressure canner as a pressure cooker? I have the model 921 and the book that came with it says you can use it as a pressure cooker too but I haven't tried it. Is there a reason I shouldn't? Just wondering before I go out and buy something else. 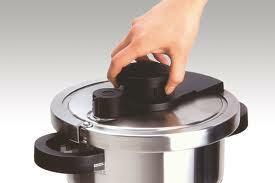 I use the canner all the time to can but have never done any pressure cooking so it will be new for me. You can, but it's HUGE which means that everytime I have to cook in it, I would have to use a lot of fuel to heat it up. And cleaning it?? Yuck, what a hassle that would be after a chicken barbeque, etc. Makes sense, thanks. I guess I know what new kitchen gadget I'm getting next. I just replaced my 20+year old round Ronco dehydrator with a 9 tray excaliber (an early Christmas present because it's harvest time) so I'll have to ask for an early birthday present (Jan.) because now I just can't wait for a pressure cooker too. LOL...save yourself some bucks without compromising and keep a lookout for a sale on the BRK brand. It doesn't hurt to call the stores and come right out and ask them WHEN they will have a sale on their BRKs or Kuhn Rikon. YaY! I have everthing on the list except the Food Saver. I am in the process of finding the best deal and then I will own one of those too. Next to save for is a Humless to run my Nutrimill and my bread machine in an emergency situation. I have a Wonder Mill Jr. and do not like it, so I need a power source for my electric mill. Curious, what don't you care for with your Wondermill Jr? I find it hard to use. It takes forever to get enough flour for a loaf of bread. I have rotator cuff problems, so I guess it is just a matter of a hand grinder not being a good "fit" for me. I ordered the new drill bit attachment for it and I have to say that was a huge mess. The drill (and it is a good heavy duty one) made the grinder slip and slide about in spite of the great mounting system on the mill and flour and grain was flying everywhere. 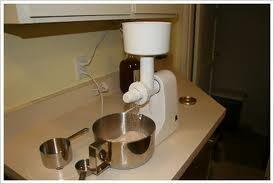 Maybe in an emergency situation, I could get family members to take turn grinding flour in exhange for bread. :) I think the best thing for me is to save for a Humless so I can use my electric model. Love my Nutrimill! PS: Do I need to get a super duper delux Food Saver or just the model they sell at WalMart ? I am so looking forward to getting the jar attachment gizmo and sealing up my dry stuff. You just need to make sure the model you get has an air port and you're set. 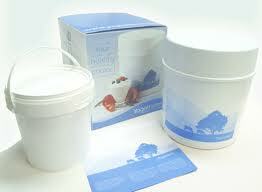 Do not get the hand pump Food Saver product. That's not the same thing and is not approved for sealing jars. Wow! LOTS of great information here! Thank you. Any links for the Korean cookstove? Thanks for all the great information! With the older models, have the towel nearby, and then gently lift the pot onto the towel, wrap the towel around the base of the model, avoiding the pressure gauge. You'll be fine. Oh, and regarding pressure cookers. I have Fallon's book and have to admit I haven't really studied it yet, but as a person who grew up in the 70's I am very familiar with pressure cookers. My mom used hers almost everyday. I still remember toiling away in my room at homework and the feeling I would get when I heard that pot hissing and whistling. It meant dinner was almost served! Mama turned out some great stuff and we were all as healty as horses and stilll are 40 years later, so I wouldn't worry about using one myself. I even remember how she would shout, " kids don't come in the kitchen, I've got the pressure cooker goin!" We'd scatter to the winds. I think she even broke the cardinal rule; she put the thing in the SINK, and ran water over it. I think she only had one blow up on her. LOL What a funny memory.. If she were alive today, she would love the newer models. Thank you, this is a very helpful article. I love my food saver which I got on Ebay for very little. I love sealing foods in jars with it because it's so fast and easy. I love my American canner but I was a little afraid of it until I got use to it. My favorite thing to can in it is meat. I live in Michigan so do you think a solar oven would not be a good choice? Do you need a hot dry climate for one to work properly? I am planning on using mine in that area, Carrie. I don't see why a solar oven wouldn't be viable on sunny days. 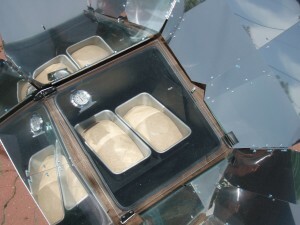 Check out the articles I've written on solar ovens on this blog and you'll get more information for your questions. Hello Carrie, I grew up in Michigan but now live in Cheyenne, Wyoming. I use my solar oven (sun oven) all the time here. You do need a sunny day but I have used it in the winter months with snow on the ground and only about 20 degrees outside. I just started it earlier in the day and kept refocusing it as the sun moved. It will work fine in Michigan as long as the sun is shining.I even dehydrate in mine and have used it to pasturize water (an experiment). I love it. When I was in Vietnam this year they all use the little portable cooktop for table side cooking. They have small cyliinders of butane and they do seem to last a long time. They normally have one going at each end of the table. I would look in one of the larger Asian Markets for them as they are usually cheaper than regular stores. Most Vietnamese do not have ovens in their homes, they do not bake in the house but have small little pots they bake in over a fire. I learned so much about ways to cook and ways to process foods while I was there. They are way ahead of us when it comes to having these skills. It's a case of "have to" for them however. I am looking forward to a return trip. I don't use a micro wave (nor do I own one) as I don't have a use for one but I know many people do and I wondered if you can use a microwave like a pressure cooker? I have never cooked meat in one so I don't know if it would cook as fast or as tender? My hubby found the deal of the century at a garage sale last week . An all american 22 Qrt canner for 5.00 bucks. Older but in great shape. whoo who. !! You'd be surprised what you find used on Amazon and E-bay. When it comes to stuff like that "can't" just isn't in my vocabulary. Worst case scenario, contact the company and inquire about setting up a wholesale account and then put it out there for others who want to order their product at wholesale so that you have enough to make a minimum order. Where there's a genuine will, there's a relative...oops, I mean a way. That really is odd about the Amish store. I wasn't lucky enough to find my American canner used but got it new about a year ago from Amazon and at that time the price was better than any other place I could find. The food saver with jar attachment I got was only around 20 dollars on Ebay about the same time. Now I'm trying to find older American made wooden clothespins at shops or sales. I haven't had any luck so far but I will keep looking! The ones from China break too easily for me. Welcome to the Michigan area Kellene. We will be happy to have your guidance in our area! Carrie, I wrote a review a while back about a product called "Best Clothes Dryer" In it one of the commenters shared a link for a source of "American made wooden clothes pins." You may want to put the product in the search bar and check that out. Besides, Best Clothes Dryer has a handful of great products, any of which I will vouch are well worth the money. Good luck! A quick question... You use the flaker attachment to grind beans? Does that work better than/as well as the grinder attachment? Hmm, maybe I should be reading the directions that came along with the grinder :). Any good bean flour recipes? We love the imitation cream of chicken soup. Keep in mind that I'm a "foodie" and I like things done right for taste and textures. So for me, yes, a flaker for beans is a much better option than a grinder. 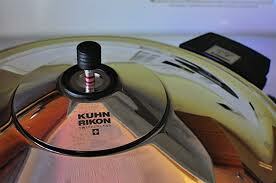 I got one of those Kuhn Rikon pressure cookers, but there is no English version of the instruction manual. Any ideas on how I can find and English version? It's the one with the button in the middle of the lid that you recommended. What the hey? Seriously? Weird. I'd contact Kuhn Rikon on their website. I'd also google it too. There are several sites which carry instruction manuals for just about everything under the sun. Hmmm, Genny. I hadn't included butane cans for my canning process because I have so many other options, but I like to have back ups to back ups to back ups...so I guess I'll need to purchase a few more cases of butane so that I have enough for each canning batch as we still intend to grow and preserve food regardless of what life throws at us. What model FoodSaver do you use? The newest one out there I believe. V3820 from Sam's Club. what size canner do you recommend? We are a small family and new to this so I have no idea where to start! The size of your family doesn't matter IMO when it comes to canning. You want to be able to do as many as you can in one batch as it will save you time and energy. The 20 something quart All American is the smallest I would get. Hi Kellene, I was thinking about getting the 921 21 Quart, but based on your comment above, would say that the 930 30 Quart would be a better choice? BTW: The 921 21 Quart has gone up by $18, I wonder if the price will go back down after the holidays? Great info.. Check your local Goodwill for Food Savers. I've gotten 2 there in the box for less than $40 each!! Unless of course the people who run the Goodwill are absolute morons and price used items MORE than they would be NEW. (just came back from ours and I was some kind of ticked to see the pricing on some of their stuff.) :-) Amazon sells used items competitively. Newbie prepper here. Hell, not even a newbie, jsut somebody who is developing an interest and is curious by nature. I am a fellow foodie though (culinary school grad). Thanks for the tip on using the vaccu-sealer to jar grains and such. Whole grains such as quinoa and barley are among my staples, and I had been wondering how to extend their self life. Problem solved! Is it possible to can liquids such as stocks in order to preserve them? You can can them the old fashioned way, but not with the FoodSaver. You'll have to use a pressure canner. I love storing my mire poix stocks and then just opening one of them when I'm in the mood for something more complex. The flavors will create a greater depth that I can even accomplish in my pressure cooker. I love brown rice, but have had real problems storing it very long without it going rancid. How long have you been able to store it in vacuum-packed jars? Does that process make much difference with nuts, which also go rancid after awhile, or do nuts need to be kept in the freezer? I've easily got 8 to 10 years when I store the dry ingredients with the FoodSaver and the Mason Jars. Very new to any type of preparedness. After reading a prvious post bought a Kuhn Rikon pressure cooker. Have used it twice. Forgive my simple questions. If I pour BBQ sauce 1/2-1 cup on chicken do I ALSO need to add the MINIMUM 1/2-1 cup of liquid(water) to pot? I have and we do not prefer how liquidy it is. Afraid not too, as it is in bold type several places to have minimum amts Of liquids. Don't think I quite get it yet. Don't want it to blow up like granny's did. We also just ordered a half of beef and are planning to freeze it. Is it ok to thaw meat and then can it? Did not know that I can food save things past expiration date. Frankly, it all depends on your BBQ sauce. Tomatoes have a high sugar content and if left to their own on the bottom of a pressure cooker they will scorch. So I add a little bit of water to just ensure that doesn't happen, but that's based on my BBQ sauce. You just don't want to fill up your pressure cooker with anything more than 2/3rds full. And I'm sure the instructions are emphasizing that you don't need very much liquid. Yes you can thaw the meat and then can it, but only do it once to minimize any risk of bacteria. Are there any special instruction for pressure canning on a flat top stove? I trust you more than I trust the manufacturers, but I'm a little worried. Any tips? Thanks! nope, just watch your pressure and temp carefully--but you'd have to do that no matter what stove you used. I got ours from Costco or Sams 4 years ago and it works like a charm. Most of the time the seals fail if people don't clean them after vacuuming something moist, but if you do it you only have to wipe the strip with a damp cloth. I have a garden and a dehydrator too, and it works great. You can also purchase additional protection plans at Costco/Sams if you're really concerned. When vacuum sealing items in jars would it help to wrap a black paper (art paper type) around the outside of the jar before storing to keep the light out? I remember reading the "best clothes dryer" article but not the comment about US made clothespins. Thank you for that information! I wouldn't go to that trouble personally. Instead I'd just make sure to store them in a closet or other environment in which there isn't exposure to light. You burner murderer, you! As I shared in the article, if it's a really old flat top, nope don't use it. If it's in the past 20 years, you're fine using it. I received my canner from Ball for free 3 years ago by doing a house party with my friends. A year later I purchased a pressure canner and have used it a lot this season. I even canned some ground beef for the first time. My pressure cooker I use is electric, made by cuisinart and I love it, I don't think I've used my slow cooker in over a year. I am waiting for a god sale on the nutrimill before I purchase one. I did buy a couple of hand crank grinders for my storage. I purchased a food saver from Smiths a couple of years ago. It was on clearance with an additional 50% off at the time. I also use my dehydrator almost daily during the growing season, I'm saving for an Excalibur 9 tray. And be sure to put a non-electrical pressure cooker on your Wish List too so that you're not caught unable to benefit from such great technology if we have a long-term blackout. Way to go! I have searched your blog for a recommendation on a butane cook stove but can't seem to find one. Do you recommend any one in particular? And should I have more than one? Would like to get one soon as it would help with canning. I seem to run out of space on my stove. I love all the info you have here! You have not steered me wrong yet!! Rose let me ask you a question...if you only had one butane stove to cook on for who knows how long, do you think you'd feel safe and secure or would you worry that something might go wrong and you'd be left without? If the answer is that you'd worry, then I'd get back ups to back ups to back ups. We live like that around here. "3 is 2, 2 is 1, and 1 is none." As for a butane stove recommendation, nope, they all are going to come out of China or Korea anyway. So just put in "butane stove" on Amazon and see what's available. Thank you!! I need to get better at thinking like this. I've spent so much time learning to "purge" my home of "unnecessary" items. Now I am stepping back and taking a good look at that kind of thinking. Just put in "FoodSaver" in the search bar here and you'll see the article as well as a link to the YouTube video. Kellene, I am in Canada and I love your site. 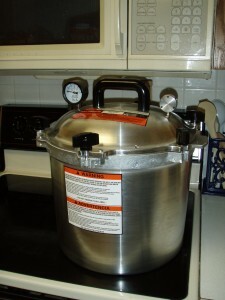 I have a pressure canner and just picked up a 4 quart pressure Cuisinart pressure cooker. 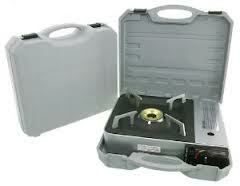 I already have a butane stove that is currently down with our camping supplies. I just need to purchase some fuel cannisters. I am now looking for a Food saver. When I look at the food savers and read the information in regards to the food saver jar sealer it says" FoodSaver® Jar Sealers replace standard Mason-type jar lids to create a vacuum seal that locks out air, the enemy of freshness. Not to be used for canning. " Yes, you CAN do this, however, one thing that folks needs to remember is that plastic still allows oxygen to exchange through it. So items that you NEED to keep free of oxygen won't work in the 2 liter bottles. Oats are hard enough to store and keep for a long time, so I'd definitely not put them in plastic. Potato Flakes would also not do well in plastic. But your hard grains, seeds, and such will be fine. Yes, you can use field corn for corn meal, but it's considered the "poor man's corn meal." It's not got the same flavor as you're probably looking for. But it will do in a pinch. Popcorn will do MUCH better ground into a corn meal and it has a much longer shelf-life than corn meal will. It's the ideal way. Or you can use dent corn. Thank you for the excellent article. You really pack a lot of information into your posts. Looks like I need to add some things to my prepping gear. So much to learn - so little time. Preppers rule! I have to agree with some of the others that a good dehydrator is important. I have a solar dehydrator but there are many days I can't use it. I also don't do meats in it since I worry about temperature control. Everyone has their own priorities but for us a dehydrator is more important than a pressure cooker since we can do the same thing in a normal pot. Roddy, I'm OK with differing opinion, however, you totally missed the whole thing about saving fuel and water in your cooking. So no, you can't do that in a normal pot. Not to mention the nutrition that you get to retain in a pressure cooker which you don't get "in a normal pot." Do you think a Spacebag would work on the dry goods? I'm frustrated and can't decide now about the Food Saver. Was all excited and ready to purchase one, mostly for the jar sealing feature........but am reading TERRIBLE customer reviews on the appliance! By far outnumber the good reviews. Most say they they work briefly but then won't vacuum anymore and lots of seal failures with the bags. In fact, I find out now my son bought one a couple years ago and had the same result..........vacuumed only the first few times, then never would again. Now I don't know what to do! You love yours so much! Also, does the jar sealer thing fit all their models? If you buy yours from Costco, they have an unconditional 1 year warranty. I haven't had ANY problems with the 3 of mine that I've purchased. All are still working well. The only problem I had was with the one that I bought on Ebay. THANKS. MAYBE I'LL TRY COSTCO THEN. THIS GIZMO WOULD WORK SO WELL FOR US BECAUSE WE GROW AND DRY ALOT OF VEG & HERBS. I've heard this a lot actually. The fix is to put TWO flat lid pieces on your jar and then use the attachment. The bottom one will seal. Then just take off the top one and then put on your ring. Weird fix, I know. But it works. I would put the contents of the Rice-a-Roni in the jar, assuming they are the same flavor. And then I put the foil bag of seasoning in a wide mouth jar, making sure each foil bag is labeled as to it's flavor and directions. You mentioned sealing bags of rice-a-roni in foodsaver bag then storing in bucket....can this be dine with jello in the original bag and other items as such? you can, but you really don't need to. Jello is mostly sugar and gelatin--both shelf stable foods. Of COURSE I have. Love them! I wouldn't have thought to though if Loren (the creator of the Tattler Lids) hadn't mentioned it to me on an interview I conducted with him. Thanks Kellene! Was wondering if they would hold a seal. Again, thanks! Will order some soon. 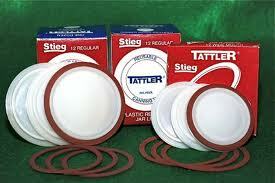 Kellene, Have you tried the Tattler lids and rings with the FoodSaver instead of the regular canning lids? Also, which of these would you buy first? I already own a butane cook stove, and so far have 50lbs of flour, but haven't bought any wheat yet, since I don't have a grinder. I'd have to say the pressure canner, then the food saver and then the sun oven...but that's a really, really hard question for me to answer. Metals are skyrocketing in price lately; I'm not surprised.I have two All American's now (got an early Christmas present) The 921 was my first and I just got the 41 quart. Now I'll be a canning FOOL! (get it all done faster too.) Just be sure to take into consideration what impediments you might have on your stovetop (such as overhangs, spacing, etc. w)hen you select one. Which "expensive white ones" are you referring to?? If you're referring to the Tattler Lids or the regularly sold Mason jar lids, your solution is not an equal comparison. The Tattler lids or the Mason Jar lids are created specifically to ensure a proper seal on the jar, whereas none of the alternatives you've mentioned here are reliable for equal protection. I recently found that the lids from peanut butter jars, grated cheese jars, etc. fit very nicely over the lids of mason jars and can replace those expensive white ones. 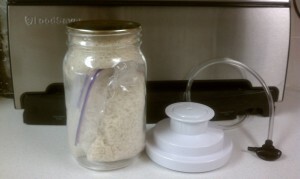 Kellene, I have a Food Saver and the wide mouth attachment, but have ordered the regular mouth since I have so many regular jars and boxes of Rice a Roni fit them real well, but am having trouble sealing with the regular attachment. Is this common? Should I return it?? Kellene, I have been a follower since 2010. Love your articles. I am confused about the Foodsaver with the Jar Method. In the picture you show jars with the regular metal twist lids on them, yet when I go to the Foodsaver site, they show a white plastic lid that is supposed to replace the metal lids. They are too expensive to buy for every jar I have. Is there something I'm missing as to how this system works. Right now I puncture a hole in the lid and put a special sealing tape over it and then pump out the air with my vacuvin pump. I have a few questions....I was led to believe that you can pressure cook in a canner...so why do you have both kinds? What do you like about the Family Grain Mill and the wondermill Junior? 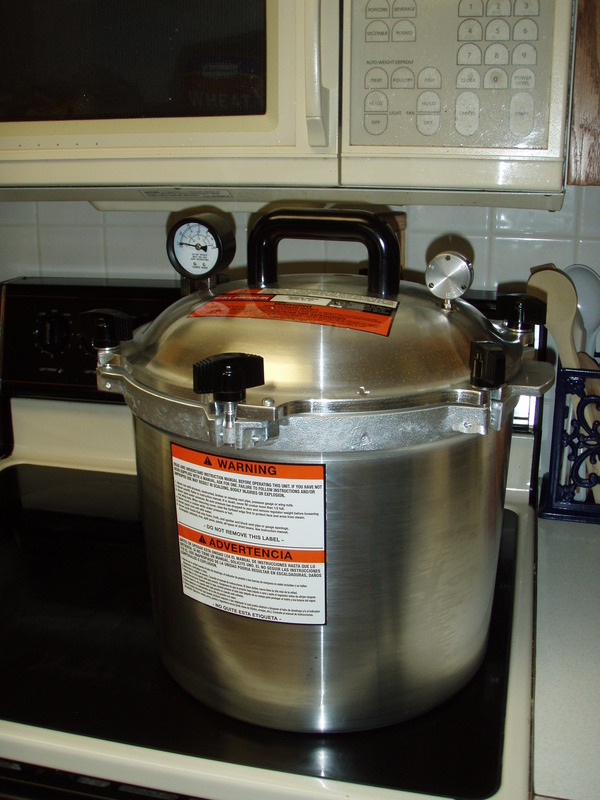 You can cook in a canner but you can't can in a cooker typically because there is not enough volume space to have sufficient pressure for canning. Canners on the other hand are very large and require significantly more fuel/time to bring up to heat for cooking in them directly. Plus, the pressure canner brands I use (Kuhn Rikon and BRK only) have additional safety features that are ideal and even necessary for everyday cooking use. I can't afford to buy a pressure canner, unless I save up. Currently all my "save up" money is going to freeze-dried or store-bought canned food. Do you suggest that I stop storing up on food (and other items) and funnel my resources into saving for a pressure canner? I haven't been prepping long, and currently have about a month of food and water stored. I wish my friends would understand how damaging the phrase "I can't..." really is... It's much better if it's phrased in a positive such as "I'm saving up for a pressure canner" or I'm looking forward to being able to purchase such and such..."
I was just trying to say that in order to buy a big ticket item, I'd have to cut costs somewhere. Do you recommend not buying food in order to get a pressure canner-- in other words, would I be better off not acquiring stored food for a while in order to buy some big ticket items? Sarah, A month's worth of food is nothing to sneeze at; be proud of yourself because you have done better that most everyone else you know. I'd get the All American Canner. Instead of cooking for "two" you cook for "six" then pressure can your leftover dinners. Your pantry will become stocked with your favorite foods instead of freeze dried that you may not like. The canned foods that you purchase at the store are just not as healthy as the ones you create from scratch. Canning is a skill. The sooner you master it the better you will feel and the more prepared you are. Hi! I found your site through a friend and love all your preparedness advice! Thank you! :) My question for you is this: where should I begin? I've been married a year and we recently bought a house. Now feels like the right time to start preparing but there is so much to buy and do that it feels overwhelming. Kellene, I am looking at purchasing an all american but I'm not sure what size to buy. I like to think bigger is better but I know that's not always true. What do you reccomend? Thanks for your help. I think the 921 is a good start. I have their biggest one too, but that requires that I do my canning outside on the turkey fryer stove top and it's hard to monitor the heat as easily. So you say if the glass cooktop is 30 yrs old I can can on it ? Mine is about 10 yrs and I have been afraid to try to can on it with my big pressure cooker. I would check your owners manual. I have a flat top stove/oven and I checked the manual which said that my model was fine for it. Just to clarify, it's if the glasstops are the older models (from their first generation manufacturing) that I don't advise using for pressure cooking or canning, but the models that are 2nd generation and beyond should be just fine. can i use my vitamixer to grind up grains?... 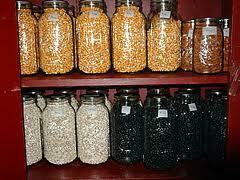 also do u have a post some where about what kind of grains to have and what can be done with them? I've had several folks who have shared with me that they used their Vitamix to grind grains, however, you will NEVER get a fine flour texture in doing so. In my opinion, it's a waste of energy and time and it may very well burn out the motor sooner rather than later. I have several posts on here regarding grains and what to have and what can be done with them. I'd suggest you just make friends with the search bar to look up what you're specifically interested in. There are more than 800 articles that I've written over the years. Not that there's nothing else to write (because I've always got about a hundred ideas in my file), but there's certainly a lot that's already been covered. Do you happen to know where the Wonder Junior Deluxe Mill is made. I always try to buy American made items and if I knew it was made in America I'd jump on it.